One of Jonathan and my memories of Kenya is how much song and dance is important to the culture. We wanted to give you an idea of the spirit of Kenya and fall in love with the people and culture as we have. We found this video on youtube and thought it captured the spirit of the Kenyan people. Hope you enjoy the video! We are so happy to find out that we will be attending the F.I.T. training with Shepherd's Staff! Hooray! Jonathan got the approval for the time off and we are so glad. We truly feel like this training will help prepare our family as we venture off into the next chapter of our life. We are so excited about what lies ahead and what God's plan is for our family. "Having now the twofold object in view of accustoming myself to endure hardness, and of economizing in order to be able more largely to assist those among whom I spent a good deal of time laboring in the Gospel, I soon found that I could live upon very much less than I had previously thought possible. Butter, milk, and other such luxuries I soon ceased to use;and I found that by living mainly on oatmeal and rice, with occasional variations, a very small sum was sufficient for my needs. In this way I had more than two-thirds of my income available for those purposes; and my experience was that the less I spent on myself and the more I gave away, the fuller of happiness and blessing did my soul become. Unspeakable joy all the day long, and every day, was my happy experience. God, even my God, was a living, bright reality; and all I had to do was joyful service. As Jonathan and I read this chapter last night (this is just a small part of the rest of the chapter) we were blown away and humbled by the candidness of Hudson Taylor and the similar feelings I (Adrienne) had about this venture. Even though we can outwardly say, "I believe and trust God for all things," I am realizing I can put my trust in other things like the "promises" and "securities" of mine and Jonathan's job (Benefits, 401K plans and such). In reality, those things in themselves don't provide the security we need. To take this step in faith is challenging whether we trust God to do what He said He was going to do. He promised to take care of us for all things. Matthew 6:25 "Therefore I tell you, do not worry about your life, that you will eat or drink; or about your body, what you will wear. Is not life more important than food, and the body more important than clothes? Look at the birds of the air; they do not sow or reap or store away in barns, and yet your heavenly Father feeds them. Are you not much more valuable than they?Who of you by worrying can add a single hour to this life? Wow, I can hardly believe it is the middle of March. We are starting to feel like our move is coming faster and faster. Pat had informed us that our whole family would be able to attend at no cost since we were missionaries with Shepherd's Staff. Wow! That's huge since our family of four would have paid $2,000 for those weeks. As we looked over the time frame (May 30th-June 13th) we didn't think it would be possible to go. Vacation time at Jonathan's work had already been requested and someone else already had that time reserved. Plus, Jonathan needed a week of vacation time for Jr. high summer camp. So we said, "Well, we can't do it unless God opens the doors." I got a call from Jonathan on Wed. night and he said, "You won't believe it, the reserved time for those weeks had been canceled. Those dates are open!" Jonathan also looked over his vacation time and found that he had enough for the total three weeks we needed. What an answer to prayer! So, Jonathan put in for the time and is now waiting for approval. Please pray that if the Lord wants us to go that this next door would open up. Also, I need to request the time off from my PT job at Starbucks. May is just around the corner and we are so excited at this possibility. Oh! And our kids say, "Happy St. Patrick's Day!" 3 John 1:5-8 "Dear friend, you are faithful in what you are doing for the the brothers, even though they are strangers to you. They have told the church about your love. You will do them well to send them on their way in a manner worthy of God. It was for the sake of the name that they went out, receiving no help from the pagans. We ought therefore to show hospitality to such men so that we may work together for the truth." We would like you to meet some of the members of our care team (believe it or not all of the members of our team are not in these photos!). Our family is so blessed that these group of individuals are here to pray and encourage us as we transition out. 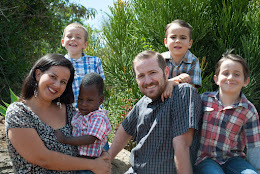 Our team meets every other Monday to help our family get out to Kenya. What do we do? Pray, plan, encourage and toss around ideas. Our team has a wealth of wisdom, gifts and SUCH a heart to serve God. We are so encouraged and blessed that God would send us such a wonderful group of people to accomplish what lies ahead. These pictures are from this last weekend. We all met on Saturday and assembled breakfast burritos to sell at church the next day to raise some of the funds needed to start up in Kenya. It was so great to see our team get together on a Saturday and just have joy in the Lord and all work together. We are so humbled and blessed by our group.